The window manufacturing industry has undergone a slow evolution over the past century. It all started with single-pane wood windows. Many houses in Greater Cincinnati, including Mount Lookout, Hyde Park, Columbia Tusculum, Glendale, Lebanon, Historic Loveland, Old Milford, and many other neighborhoods, still boast single-pane wood windows. With the introduction of vinyl, wood took a backseat to a material that required almost no maintenance and would not rot or peel. Homeowners soon discovered that vinyl, unlike wood, warps, discolors, and is a very poor insulator. Through decades of testing and experimentation, Andersen has developed a wood composite window that combines the structural benefits of wood with the maintenance free aspect of vinyl windows. 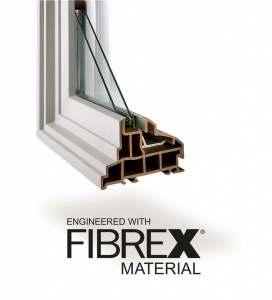 This innovative product is called Fibrex®, and it has revolutionized the window industry. The Andersen Corporation’s research and development efforts began laying the groundwork for Fibrex® clear back in the 1950’s, when it began experimenting with hollow vinyl windows. After much experimentation, Andersen decided not to sell vinyl windows due to poor insulation and lack of structural rigidity. In 1966, Andersen developed its first clad-wood window featuring a tough, formed polymer exterior. In 1991, Andersen Corporation debuted Fibrex, a groundbreaking wood composite that is twice as strong as vinyl and stands up to any weather condition without rotting, chipping or warping. Constant sun exposure, heavy rainfall, and sustained freezing temperatures won’t harm a Fibrex window. The exceptional strength allows a Fibrex frame to be manufactured with more glass area and narrower lines, so you can enjoy better natural lighting and windows with more viewing area. The beauty of Fibrex lies in its similarity to wood. The material can be crafted to create the authentic look of a wood-framed window but without the poor efficiency and constant maintenance demands. Fibrex is available in over 30 beautiful exterior colors, including dark colors that can’t be found in vinyl. The interior of a Renewal by Andersen Fibrex window can be clad with your choice of real wood species and an infinite number of customizable stained or painted variations. 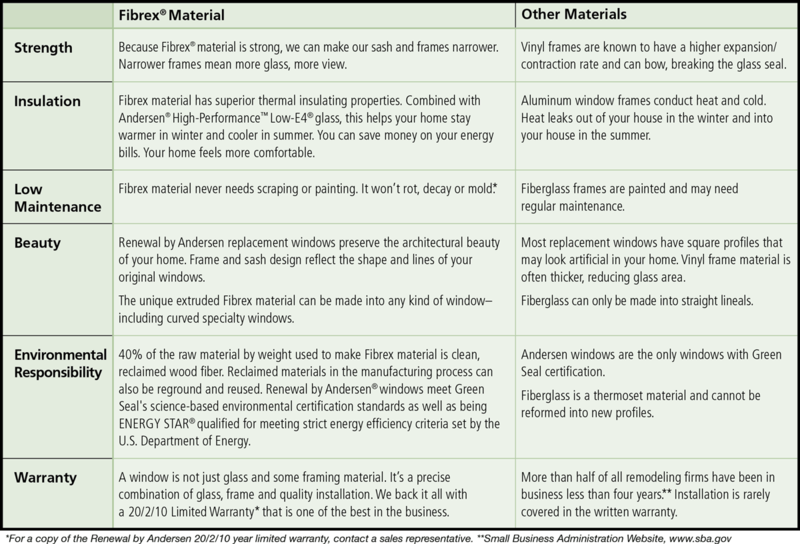 Forty percent of the wood fiber used in Fibrex frames is reclaimed from the manufacture of Andersen clad wood windows. The sustainable process used to manufacture Fibrex also recycles excess material into the next production cycle, so there is very little waste associated with these windows. When you select Renewal by Andersen® of Cincinnati for replacement windows, every window you choose will be produced using Fibrex and high-efficiency glass for superior performance. Call Renewal by Andersen today at (513) 283-8981 to learn more about the benefits of Fibrex.